Lady Death: Revelations #1 is coming to comic shops near you in 4 brand new editions in January 2017, starting at $3.99 US! Lady Death has many sides to her dark personality and these “revelatory” images will show you sides of her you’ve never seen. Feast your eyes on illustrations by some of today’s finest pin up artists including Mike DeBalfo, David Harrigan, Scott Lewis, David Nakayama, Richard Ortiz, Romano, Nei Ruffino, and many more! Hand picked and art directed by Lady Death creator Brian Pulido. 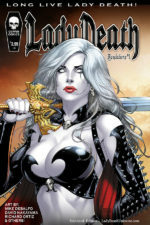 You can now preorder these editions at Lady Death Store and get your copies signed FREE by Lady Death creator Brian Pulido at your option! 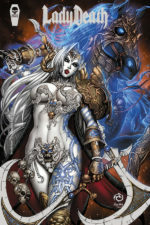 Exclusive to Lady Death Store, we’ll also be offering a Revelations #1 Comic Market Set for $72.98 that includes all 4 editions, plus two FREE bonus editions! Click here for the complete listing of Revelations #1 Comic Market Editions! Cover: Mike S. Miller, Nanjan J. Full color, 28 pages. Limited edition with foil cover enhancements! Full color, 28 pages. Limited “Naughty” edition! All editions from this solicitation are expected to ship by January 25, 2017.